Churchill was right about democracy being the worst form of government, except for all the others that have been tried. Yet we should be able to respond to evidence of democracy’s failings with something more than Churchillian resignation. So why not address the problem in our education system, by teaching basic economics and statistics in high schools? Students usually now encounter statistics, if at all, in college. But simple statistics could easily be taught along with algebra in high school. Likewise, principles of economics could be taught in social studies classes. I have long thought that a year of economics should be standard in high school, much as American history is now. I even have a good textbook to recommend. The latest op-ed from Larry Summers. Passed by a vote of 20-1, the Senate Finance Committee's measure would allow U.S. companies to seek anti-dumping duties on goods from any country that maintains a "fundamentally misaligned" exchange rate after being formally cited by the United States. I am hoping for a veto threat. For now, kudos to Senator Maria Cantwell for being the sole vote against the measure. A prominent Harvard economist emails me to recommend David Brooks's column from a few days ago. He calls it "truly fantastic and obviously correct." With such a strong recommendation from a colleague, I took a break from J.K. Rowling to read Brooks. While not quite as magical as the story of Harry, Ron, and Hermione, the Brooks piece is well worth reading. It is far more informed by cutting-edge economic research than most things you find on the op-ed pages. If you've paid attention to the presidential campaign, you've heard the neopopulist story line. C.E.O. 's are seeing their incomes skyrocket while the middle class gets squeezed. The tides of globalization work against average Americans while most of the benefits go to the top 1 percent. This story is not entirely wrong, but it is incredibly simple-minded. To believe it, you have to suppress a whole string of complicating facts. The first complicating fact is that after a lag, average wages are rising sharply. Real average wages rose by 2 percent in 2006, the second fastest rise in 30 years. The third complicating fact is that despite years of scare stories, income volatility is probably not trending upward. A study by the C.B.O. has found that incomes are no more unstable now than they were in the 1980s and 1990s. The fourth complicating fact is that recent rises in inequality have less to do with the grinding unfairness of globalization than with the reality that the market increasingly rewards education and hard work. A few years ago, the rewards for people earning college degrees seemed to flatten out. But more recent data from the Bureau of Labor Statistics suggests that the education premium is again on the rise. Fifth, companies are getting more efficient at singling out and rewarding productive workers. A study by the economists Thomas Lemieux, Daniel Parent and W. Bentley MacLeod suggests that as much as 24 percent of the increase in male wage inequality is due to performance pay. Sixth, inequality is also rising in part because people up the income scale work longer hours. In 1965, less educated Americans and more educated Americans worked the same number of hours a week. But today, many highly educated people work like dogs while those down the income scale have seen their leisure time increase by a phenomenal 14 hours a week. Seventh, it's not at all clear that the big winners in this economy are self-dealing corporate greedheads who are bilking shareholders. A study by Steven N. Kaplan and Joshua Rauh finds that it's not corporate honchos who are filling up the ranks of the filthy rich. It's hedge fund managers. Or, as Kaplan and Rauh put it, ''the top 25 hedge fund managers combined appear to have earned more than all 500 S.&P. 500 C.E.O. 's combined.'' The hedge fund guys are profiting not because there's been a shift in social norms favoring the megarich. It's just that a few superstars are now handling so much capital. Eighth, to the extent that C.E.O. pay packets have thickened (and they have), there may be good economic reasons. The bigger a company gets, the more a talented C.E.O. can do to increase earnings. Over the past two and a half decades, the value of top U.S. companies has increased 500 percent, according to Xavier Gabaix and Augustin Landier. The compensation for the C.E.O. 's of those companies has also increased 500 percent. Ninth, we're in the middle of one of the greatest economic eras ever. Global poverty has declined at astounding rates. Globalization boosts each American household's income by about $10,000 a year. The U.S. economy, despite all the bad-mouthing, is chugging along. Thanks to all the growth, tax revenues are at 18.8 percent of G.D.P., higher than the historical average. The deficit is down to about 1.5 percent of G.D.P., below the historical average. All of this is not to say everything is hunky-dory. Inequality is obviously increasing. There's evidence that global trade is producing more losers. Instead, the main point is that the Democratic campaign rhetoric is taking on a life of its own, and drifting further away from reality. Feeding off pessimism about the war and anger at Washington, candidates now compete to tell dark, angry and conspiratorial stories about the economy. I doubt there's much Republicans can do to salvage their fortunes by 2008. But over the long term a G.O.P. rebound can be built by capturing the Bill Clinton/Democratic Leadership Council ground that the Democrats are now abandoning. Whoever gets globalization right will have a bright future, and in the long run, the facts matter. Here's the latest on taxing carried interest: A prominent Democrat is trying to stop a prominent Republican from raising taxes on money managers. Schumer may be trying to shield both his Wall Street constituents and his party's electoral war chest, Grassley said. The Democratic Senatorial Campaign Committee, which Schumer heads, received $779,100 from employees of private-equity firms and hedge funds in June, six times their combined total in June 2005, federal filings show. That far exceeds the industry's contributions of about $60,000 to the Republican Senate committee. If you read this blog, you know my views on this policy debate. A tax on carbon emissions from business and household production would not only help reduce global warming--by how much is still controversial--but it would also lower the world prices of these fuels through reducing the demand for fossil fuels. Lower prices would cut the revenues received by Middle Eastern states from the sale of oil and natural gas. This is why a carbon tax receives support from many environmentalists and national security advocates. Can you really tell whether worker is losing his job due to trade or due to other forces, such as technological change? Is a worker who loses a job due to trade deserving of a more generous safety net than a worker who loses his job due to other forces, such as technological change? Blogging will be slow over the next week or so. I will be busy reading the new Harry Potter book--out loud to my older son, as I read the previous six volumes. He can now read them himself, but reading them out loud together has become a tradition for us. Addendum: Megan McArdle explains that she is not a Potter-head because J.K. Rowling falls short on basic economic principles. Several people have asked me my views on the taxation of carried interest. It is a complicated issue, and I don't pretend to be an expert on tax law, but here goes. why does Henry Kravis pay a lower tax rate on his management fees than I pay on my book royalties? One hedge fund manager told me that the initial value of the carried interest should be taxed as ordinary income and then the subsequent returns should be taxed at the capital gains rate. Maybe so, but taxing the terminal value as ordinary income (as is being proposed) seems strictly better for the manager in present value. It is as if the manager put the initial value of the carried interest in a tax-deductible IRA, deferring tax on this compensation until the money is withdrawn at a later date. The proposed reform, therefore, does not seem excessive. John Berry's recent article on carried interest suggests that the Bush administration is opposed to reform. If so, I fear the administration is on the wrong side of the issue. Update: The FT reaches the same conclusion. I don't disagree with anything in your blog, but I think you should have noted that this rule extends beyond the carried interest and reflects the general treatment of partnership profits interests received for services in all industries. Aid to poor countries has little effect on economic growth, and policies that rely on such claims should be reexamined, two former International Monetary Fund economists wrote in a paper released this month. "We find little evidence of a robust positive correlation between aid and growth," wrote Raghuram Rajan, who stepped down as IMF chief economist at the end of 2006, and Arvind Subramanian, who left the IMF this year, said. "We find little evidence that aid works better in better policy or institutional environments, or that certain kinds of aid work better than others," they added. Rajan is now teaching at the University of Chicago, while Subramanian joined theWashington-based Peterson Institute for International Economics. "Our findings suggest that for aid to be effective in the future, the aid apparatus will have to be rethought." Medical care involves far trickier challenges in balancing redistribution and incentives for quality care and innovation. It is one thing to guarantee everyone equal access to medical care when health expenditures account for 5 per cent of GDP, as they did in the early 1950s in the US. It is another thing to do so when health expenditures reach 16 per cent of GDP as they do today and it will be even more problematic if expenditures rise to 30 per cent of GDP, as some leading economists such as David Cutler, Robert Hall and Charles Jones have predicted. With healthcare at 30 per cent of GDP, efforts to maintain equality may begin to seem like Marxism. Chapter 21 of my favorite economics textbook has a brief discussion of Giffen goods--goods for which a lower price decreases the quantity demanded. This occurs when a negative income effect (the good is inferior) exceeds the substitution effect. To the best of our knowledge, this is the first rigorous empirical evidence of Giffen behavior. It is ironic that despite a long search, in sometimes unusual settings, we found examples in the most widely consumed foods for the most populous nation in the history of humanity. A good example for the next edition. If you read Sunday’s business section, you probably noticed that Gregory Mankiw, the Harvard economist, blogger and Republican policy adviser, wrote the Economic View column. His debut as a regular contributor is the start of some changes in our economics coverage. They are a stellar group, and they will use the column to examine everything from big policy questions to the economics of everyday life. By moving the economists to Sunday, when our section isn’t filled with news, we think we can give their writing more attention. Here is my proposed topic of discussion for the comments section: Is this a "fair and balanced" group? In particular, one might ask two more specific questions. First, if you count the number of these eight economists who lean left and the number who lean right, perhaps leaving out a few without any particular political viewpoint, what ratio do you get? Second, is this group representative of the range of views in the American Economic Association? Bonus question: What economist would you to have seen added to this list? The government's latest proposal is to reduce the amount companies contribute to the state-run health-care and pension systems, which is based on the size of their work forces. To make up for the lost income, it would raise France's value-added tax. Here is a good question for discussion: If a government reduces a payroll tax and raises a consumption tax, how does the tax shift affect the economy? 1. The Labor-Leisure Decision. The shift does not alter the tax distortion between leisure and consumption. Both consumption taxes and payroll taxes distort that margin. The tax is collected at a different place (at the store rather than at work), but the disincentive to work is roughly the same. 2. The Saving Decision. Neither tax distorts the decision about consuming today versus consuming in the future. So the tax shift does not affect the incentive to save. 3. Distributional Effects. The shift may have some distributional effects--in particular, on the old versus the young. The old have already paid taxes on their wage income and now will have to pay taxes again when they consume out of savings. The young would seem to benefit by this shift of the tax burden to older generations. If the young have higher propensities to save than the old, this distributional effect could raise aggregate saving. 4. Short-run Macro Disequilibrium. Assuming the pretax price of goods is given by world prices, the after-tax price of goods in France will rise with the new sales tax. Nominal wages will rise as well, so that the after-tax real wage will be approximately unaffected. The transition to higher prices and higher nominal wages may not be instantaneous, so there may be some short-run macroeconomic effects (as was studied in this 1986 paper by Poterba, Rotemberg, and Summers). In particular, if nominal wages are slow to adjust to their higher level, the real wage will be temporarily lower than its equilibrium level, and this would tend to stimulate employment for a while. - A lot of non-traded goods and services are exempt from VAT. So the reform would [depress] consumption of traded goods and services relative to non-traded goods and services. - Payroll taxes are highly progressive for wages between the minimum wage and 1.6 times the minimum wage. The reform would hurt those people, as the VAT is linear and not progressive. - A lot of empirical studies find that a part of the VAT - up to 15% of the VAT - falls directly on firms and is not transmitted to consumer. This is called "VAT remanence" in French. Hence a VAT increase represents an increase in the tax on capital (investment). - There is a lot of VAT fraud in Europe, that basically involves creating an ad-hoc firm that is supposed to go bankrupt with VAT liabilities. - For many people, income comes from transfers from the government in one form or another. In France, this is true of pensions, unemployment benefits etc. Most of these transfers are indexed on inflation. So the reform would be neutral for them. A big question, given the importance of the public sector in France, is civil servant's wages. Thanks, Emmanuel, for those insights. I am puzzled by one thing: Why is a young, productive, untenured economist like you wasting time reading this blog? I applaud Mankiw, the Times, and Romney for having the courage to produce what is essentially a position paper on taxation in the pages of the Times. As long as everyone’s cards are on the table, which they are here, I see no harm. But I sure would have liked to see the e-mails back and forth between the Mankiw and the Romney camp as the Times piece was being edited. Yes, that's it. No emails. No phone calls. No smoke signals. I am not an employee of the campaign. I am a Harvard professor, expressing my own views, sometimes publicly, sometimes privately to a candidate for President. After listening to a variety of advisers with various perspectives, Romney decides on his own what positions to take. Not surprisingly, sometimes we disagree. But I do not vet what I write with the Romney campaign, and my opinion pieces should most definitely not be construed as position papers for the campaign. A profile of my Harvard colleague Roland Fryer. On Capitol Hill and on the presidential campaign trail, Democrats are increasingly moving toward a full-throated populist critique of the current economy....The more populist tone is one indication of a broader debate among Democrats over economic policy and how much they should break with the careful centrism of the Clinton years embodied by Robert E. Rubin, the former treasury secretary, who was a champion of free trade and cutting deficits. In tomorrow's NY Times, you can read a trenchant analysis by one of my favorite economists. The FCC abolished the Doctrine in 1987 after concluding that “a multiplicity of voices in the marketplace assured diversity of opinion.” Since then, a variety of alternative broadcast voices have flourished. In addition to newspapers and television, the public square open for debates has expanded to include talk radio, cable and satellite television, and the internet. The marketplace has allowed free speech to flourish. Some Democrats in Congress have indicated their desire to seek legislation reinstating the Fairness Doctrine, in particular to regulate the content of radio broadcasts. In May, The American Spectator reported that Speaker Pelosi and Majority Leader Hoyer will “aggressively pursue” reinstatement of the Fairness Doctrine over the next six months, and in past weeks, Senators Durbin, Kerry, and Feinstein have all supported its reinstatement. We think it makes sense to look at the diversity of views across different types of media, and not just within one medium. This is particularly true as Americans expand, diversify, and customize their news sources. Decades ago, most Americans got their news and opinion from the evening news on the major television networks, from their local newspaper, and for some, from one of a few national newspapers. Now, in addition to those more traditional sources, Americans are also watching dedicated cable news and specialty channels. They are listening to talk radio over not just AM and FM spectrum, but satellite and internet radio. And they are getting their news, opinion, and commentary on public issues of interest from websites sponsored by news organizations, as well as blogs, discussion groups, and news feeds from individuals and organizations. The availability and accessibility of diverse points of view on public issues of interest has never been greater, and there is therefore no good reason to reinstate the Fairness Doctrine. Al Hubbard sent the following letter today to interested parties. As you probably know, some Members of Congress have recently indicated their desire to seek legislation to regulate what is said on the radio by reinstating the so-called Fairness Doctrine, which was abolished in 1987 after the FCC concluded that "a multiplicity of voices in the marketplace assured diversity of opinion" on our airwaves. Since then, the multiplicity of voices has significantly increased — and the case for the Fairness Doctrine is weaker than ever. Reinstating the Fairness Doctrine would muzzle political debate and free speech. I therefore want you to know that the President would veto any legislation reinstating the Fairness Doctrine. Don't worry, dear reader: Regardless of the outcome of this battle, you can be sure this blog will always be fair and balanced. Charles Murray writes about the SAT. If you want to understand the debate over taxing carried interest, this recent testimony by CBO director Peter Orszag is a good place to start. This year's budget deficit (for Fiscal Year 2007) is now projected to be $205 billion. At 1.5% of GDP, this year's deficit is well below the 40-year average of 2.4% of GDP. Federal tax receipts are now at 18.8% of GDP, higher than their 40-year historic average. “What I’ve learned is anyone who says anything even obliquely that sounds hostile to free trade is treated as an apostate,” Mr. Blinder said. 1. Alan's views are a challenge to the economic mainstream. 2. Alan did not present his new views in a refereed academic publication but instead in Foreign Affairs, a publication aimed at the broad policy community, and then in the Washington Post. 3. Alan's new views are conveniently consistent with the political party with which Alan is affiliated. 4. Alan's arguments are not persuasive. It is as if I wrote an article saying that the broad-based income tax cuts raise tax revenue and then published it in the Club for Growth Newsletter with a summary on the editorial page of the Wall Street Journal. My fellow economists would look upon me as an apostate, and they would be right. I never blog, and may never again. But this one is over the top, Greg. 1. Out of the mainstream? Both my friend and former student and I teach introductory economics to some pretty smart students. With me, the first lesson on international trade is that (and why) there are gains from trade. (I love Ricardo!) The second is that trade always creates both winners and losers, though the nation as a whole gains. Don't Harvard students hear the second? 3. Consistent with my party's views? That's not what many in my party think. 4. Not persuasive? Well, persuasiveness is in the mind of the beholder. I clearly haven't persuaded Greg. But, then again, I never persuaded Milton Friedman to stop watching M2. I could respond, but I won't. Since I picked this fight, I will let Alan have the last word. I am happy enough to be put in the same category as Milton Friedman. For many economists, questioning free-market orthodoxy is akin to expressing a belief in intelligent design at a Darwin convention: Those who doubt the naturally beneficial workings of the market are considered either deluded or crazy. Many economists in the past have questioned "free-market orthodoxy"--for example, Samuelson, Tobin, Modigliani, Solow, Sen, Stiglitz, Akerlof, Phelps,.... Does the economics profession consider these guys "deluded or crazy?" No, we give them Nobel Prizes! Maybe it's because I have spent my education and career at Princeton, MIT, and Harvard, rather than Chicago, but I have never viewed the economics profession as being dominated by free-market orthodoxy. As is well known, future Congresses will need to either raise taxes or reform entitlement programs to close the looming fiscal gap. A recent letter from CBO suggests one way this future history might play out: Congress can just wait and let the passage of time do the work. The first tax scenario CBO examined assumes that current tax law is unchanged for the individual income tax through 2050. All other taxes are assumed to remain constant as a share of GDP. Although statutory tax rates are not changed, income growth raises effective tax rates....By CBO’s calculations, this scenario would raise roughly the amount of revenues needed to finance the spending path in which excess health care cost growth is 1 percentage point per year in the future. [That is, health care costs per beneficiary grows 1 percentage point faster than per capita GDP.] However, it would not be sufficient to finance the spending path in which such cost growth is 2.5 percentage points per year. Depending on the path of health spending, the automatic tax increases built into current law may be enough to close much of the long-run fiscal gap. These numbers include, I believe, the automatic expiration of the 2001 and 2003 tax cuts, as well as the bracket creep that occurs as economic growth pushes people into higher tax brackets. Of course, one should not underestimate the size of the implied tax hikes. For the median married taxpayer with two kids, the average effective tax rate (including both income and payroll taxes) rises from 20.0 to 37.6 percent. 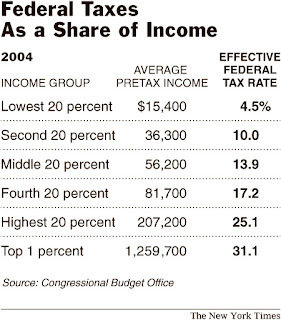 The marginal tax rate for this taxpayer rises from 30.3 to 50.3 percent. Ben Bernanke gave a talk on inflation expectations and inflation forecasting at the NBER monetary economics summer institute this afternoon. Ben included about a dozen references to the Phillips curve--an economic concept you would not hear his predecessor talk much about. The event was, by the way, the first NBER meeting in my memory that involved TV cameras and the Secret Service. Addendum:The RTE blog says that my Harvard colleague Ben Friedman, who opposes inflation targeting, will, on the behest of Barney Frank, testify on Capitol Hill next week in advance of Ben Bernanke's testimony. New York magazine contrasts Hill and Bill on globalization. Update: But Hill and Barack are on the same page. One useful website for locating economic research is IDEAS. But for some reason, only about two thirds of top economists have registered. Why don't the other one third? It only takes a few minutes. Don't they want free publicity for their research? Or are they just averse to finding out where they stand? A friend emails me to ask whether it is true that Caroline Hoxby is leaving Harvard for Stanford. Yes, it's true. It is especially sad news for ec 10: Caroline gave one of the most popular guest lectures. David Leonhardt reviews Steven Landsburg's latest book. He suggests it won't become a megaseller like Freakonomics. David is probably right, but I don't think he quite puts his finger on why. Here is my hypothesis: Freakonomics was light on theory, heavy on (quirky) facts, and that is why it appealed to so many people. 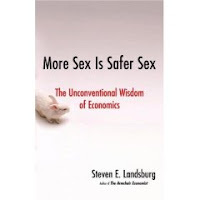 Landsburg is lighter on facts, heavier on (quirky) theories. He revels in the sometimes surprising logic of economics, which is not nearly as compelling for laymen as it is for econ professors. By the way, I have read the Landsburg book and recommend it. But, then again, I am an econ professor. A majority of Americans believe it is important to reduce the energy consumption from automobile use, the poll shows. When considering a range of strategies, 79% of respondents said encouraging the development and use of alternative fuels is important and 73% said it is important to increase fuel efficiency standards on all vehicles. Only 5% of those polled said they support creating a tax on driving. We economists need to keep pounding on the first lesson of economics: TANSTAAFL. Alumni with kids are 13 percentage points more likely than alumni without kids to give in any year. The tendency to give rises slowly—by three more percentage points total—through kids' early teens. At about age 14, as mom and dad see their kid's algebra and composition grades, they decide whether he or she will apply to the alma mater. If they decide against, then they need not give extra to grease his way in. But if the kid is legacy material, then the parents might feel a need to show some generosity to Anon U. And, indeed, while giving declines after age 14 among parents of kids who do not go on to apply, giving rises from about 18 to 25 percentage points (above the level of the childless alums) for those whose kids do apply a few years later. The timing is certainly suggestive. A short video clip with Obama adviser Austan Goolsbee. I found this article by Hal Varian, and a sentence at the end caught my attention. It says that although the Chinese only add 1% of the iPod's value, each unit exported to the US contributes about $150 to the bilateral deficit. This left me wondering: could bilateral trade numbers, namely the US deficit with China, be a fiction? The trade balance we have been discussing measures the difference between a nation’s exports and its imports with the rest of the world. Sometimes you might hear in the media a report on a nation’s trade balance with a specific other nation. This called a bilateral trade balance. For example, the U.S. bilateral trade balance with China equals exports that the United States sells to China minus imports that the United States buys from China. The overall trade balance is, as we have seen, inextricably linked to a nation’s saving and investment. That is not true of a bilateral trade balance. Indeed, a nation can have large trade deficits and surpluses with specific trading partners, while having balanced trade overall. For example, suppose the world has three countries: the United States, China, and Australia. The United States sells $100 billion in machine tools to Australia, Australia sells $100 billion in wheat to China, and China sells $100 billion in toys to the United States. In this case, the United States has a bilateral trade deficit with China, China has a bilateral trade deficit with Australia, and Australia has a bilateral trade deficit with the United States. But each of the three nations has balanced trade overall, exporting and importing $100 billion in goods. Bilateral trade deficits receive more attention in the political arena than they deserve. This is in part because international relations are conducted country to country, so politicians and diplomats are naturally drawn to statistics measuring county-to-country economic transactions. Most economists, however, believe that bilateral trade balances are not very meaningful. From a macroeconomic standpoint, it is a nation’s trade balance with all foreign nations put together that matters. The same lesson applies to individuals as it does to nations. Your own personal trade balance is the difference between your income and your spending, and you may be concerned if these two variables are out of line. But you should not be concerned with the difference between your income and spending with a particular person or firm. Economist Robert Solow once explained the irrelevance of bilateral trade balances as follows: "I have a chronic deficit with my barber, who doesn't buy a darned thing from me.” But that doesn’t stop Mr. Solow from living within his means, or getting a haircut when he needs it. In today's NY Times, David Leonhardt describes MIT economist Amy Finkelstein's latest research. Economists sometimes serve vested interests, and will change their views accordingly. The best example is also one of the best economists, Greg Mankiw. This textbook-writing Harvard prof was Bush’s chief economist for awhile, and during his confirmation hearing and subsequent tenure at the White House, he constantly defended Bushonomics, including supply-side beliefs that he once argued were the musings of “cranks and charlatans." The problem is, he did not check his facts. I used the phrase "charlatans and cranks" in the first edition of my principles textbook to describe some of the economic advisers to Ronald Reagan, who told him that broad-based income tax cuts would have such large supply-side effects that the tax cuts would raise tax revenue. I did not find such a claim credible, based on the available evidence. I never have, and I still don't. The book made clear that the critique applied to a particular reason to favor the tax cuts, not necessarily to the policy of cutting taxes. There are many reasons a person might favor tax cuts besides the belief that tax cuts are self-financing. I hope it is not too pedantic to point out that there is a big difference between rejecting a policy and rejecting one argument made by some proponents of the policy. In the second edition of the text, I took out the phrase "charlatans and cranks" because an editor and some readers of the first edition said (correctly) that it was too inflammatory for a textbook description of a policy debate. But the substantive analysis of tax policy stayed about the same. This old post includes an excerpt from the current edition. My other work has remained consistent with this view. In a paper on dynamic scoring, written while I was working at the White House, Matthew Weinzierl and I estimated that a broad-based income tax cut (applying to both capital and labor income) would recoup only about a quarter of the lost revenue through supply-side growth effects. For a cut in capital income taxes, the feedback is larger--about 50 percent--but still well under 100 percent. A chapter on dynamic scoring in the 2004 Economic Report of the President says about the the same thing. Okay, let's just say he is mistaken. Reread my post and you and your readers will see that I was making no substantive comments at all about your views on supply-side. I was asserting that your economics, as I understand them, are quite different from Bush economics, as I understand them. And I raised the supposition that perhaps you thought you could move economic policy in a better direction. In this spirit, I raised the question, as Brad DeLong put it in his comment about this: is it worth the sacrifice of the economics profession's outside credibility and the further confusion of the public that is entailed when good economists defend bad policies on the outside that they are working to change on the inside? My answer is 'no'--yours is 'yes.' I'm by no means sure I'm right and it seems to me that this is an important discussion, one worthy of your attention. Your comments about your different textbook editions and your defense of your view on the revenue impacts, while interesting, are beside the point. I fear that when great economists like you align themselves with folks like these, it hurts our credibility, and makes it harder for us to bring our analysis to bear in objective ways. I know that you and year readers are critical of EPI in this spirit as well, and I'm happy to have that debate too. In fact, the one critique from your readers that made sense to me was the one that said I should have used some examples where left-leaning analysts make unjustified assumptions leading to inaccurate predictions. Good point. Anyway, keep up your good work--I'm with you on energy taxes--and jeez, I'd have thought you'd have a thicker skin after hanging around DC! Perhaps you could post this on your site. The U.S. economy is remarkably flexible and resilient. Had we done nothing, the economy would eventually have recovered from the recession. But the actions the President took made the recession less severe. As the President has discussed, analysis done within the Administration has shown how his tax cuts have substantially offset the series of adverse shocks that have been buffeting the economy. Simulations of a conventional macroeconomic model show that, without the tax cuts, the level of real GDP would have been about 2 percent lower in the middle of 2003. About 1.5 million fewer people would have jobs today. The job market is not what we would like it to be right now, but it would have been worse without the Administration’s actions. One can view the short-run effects of these tax cuts from a classic Keynesian perspective. The tax cuts let people keep more of the money they earned. This supported consumption and thus helped maintain the aggregate demand for goods and services. There is nothing novel about this. It is very conventional short-run stabilization policy: You can find it in all of the leading textbooks. But in addition to providing a Keynesian stimulus to consumption, the tax cuts also addressed today’s most important cyclical problem: sluggish investment. As you know, the 2001 recession was unusual in the degree to which weak investment was a central driving force. Investment weakened substantially starting in 2000, as firms joined stock-market investors in reevaluating prospects for future earnings growth and developed a reduced tolerance for risk in the aftermath of the bubble. The corporate governance scandals may also have played some role in reducing the willingness of corporate CEOs to take on risky projects. To counter these developments, the Administration’s tax cuts were designed to give businesses increased incentives to invest. The package included lower taxes on dividends and capital gains; enhanced expensing for small businesses; temporary bonus depreciation; and elimination of the estate tax. In addition, lower individual tax rates help sole proprietorships, partnerships, and S corporations. For these taxpayers, income flows through to their individual tax returns. All of these initiatives lower firms’ cost of capital. The tax cuts have thus supported demand—both consumption and investment. This will help bring the economy back closer to potential. We are not there yet, and clearly not so in the labor market. But there are indications that the economy is firming, and we expect progress in the labor market to follow. The Administration’s tax cuts, however, should not be viewed only from a short-run perspective. They were also designed taking into account the important long-run, supply-side effects. Lower marginal tax rates on both labor income such as wages and on capital income such as dividends and capital gains improve incentives and so boost growth in potential output. We will not just get back to potential; instead, we will have a new and better long-run growth path. Lower marginal tax rates on wage income will increase work effort, while lower taxes on capital income will increase investment and thus capital accumulation. More capital means that each worker has more tools and is more productive, and improved productivity means higher wages. In addition, lower taxes on dividends and capital gains, as included in the most recent tax bill, also reduced the unequal tax treatment of corporate and noncorporate capital. Moving toward a more level playing field between different types of capital will increase efficiency, as capital is allocated with more of a focus on profit and less concern for tax avoidance. The qualitative effects of these tax changes on the short-run output gap and on long-run potential output are not controversial. There is less agreement on quantifying these effects—how many jobs were created, how much growth was increased, and so on. To answer these questions, one would normally turn to a macroeconomic model such as those maintained by private forecasting firms, the Federal Reserve, and other institutions. I view such models as being very useful at relatively short time horizons such as one or two years. Over this horizon, demand-side effects predominate. These models, however, typically devote less attention to supply-side effects. So beyond 18 or 24 months when supply-side factors become increasingly important, one should be careful to recognize the limitations of these models. As I have already mentioned, another area in which the standard analysis of tax policy misses the mark is in the projections of the budgetary costs—the “scoring” of a tax bill. The standard analysis assumes that changes in tax policy do not have any macroeconomic effects. That is, tax cuts are assumed not to affect economic growth, either in the short run or in the long run. It is as if a tax on ice cream machines were assumed to have no impact on the market for ice cream. Although it is hard to estimate the impact of a tax cut on output, we know that it is not likely to be zero. The standard “static scoring” uses a precise but wrong answer—zero—to derive the “sticker price” of a tax cut. Conventional scoring does allow for the possibility that individuals change behavior in response to tax cuts. For a capital gains tax cut, for example, conventional scoring recognizes that capital gains will be realized more frequently. But the analysis does not recognize any macroeconomic effects on investment or output. As a result, the true price of a tax cut differs predictably from the sticker price, as higher growth will lead to more revenue. I do not believe the revenue feedback is enough to fully pay for a tax cut in most cases, but it is likely to make a meaningful offset. For looking at the short-run costs of tax policy, the dynamic effects need not rely on supply-side phenomena; they can be based on the simple Keynesian demand-side effect of fiscal policy. Over a longer horizon, supply-side effects will be more salient. I do not think anyone can be confident about how much the true “dynamic score” of a tax change differs from the “static score.” This is a hard problem. It is no criticism of people who work on scoring that they have not yet perfected the art, particularly in light of the time and resource limitations they face. One thing to keep in mind, however, is that because of their effect on capital accumulation and thus on potential output, capital tax cuts are likely to cost less over the long run than other types of tax cuts. That is, a tax cut that lowers the cost of capital will widen the tax base by more than a tax cut of equivalent size on labor income. Of course, the expansionary effects of the tax cuts will be offset to some degree by the effects of the budget deficits that arise from lower revenues. Deficits can raise interest rates and crowd out of investment, although I should note that the magnitude of this effect is much debated in the economics literature. The main problem now facing the U.S. economy is not high interest rates, but at some point continued deficits would matter and could impede growth. This is why, as the President has said, spending restraint is so vital. The Administration would prefer not to have deficits, but deficit reduction is only one of many goals. Reversing the tax cuts today, as some have suggested, would depress growth and job creation. This is a matter of priorities: In the face of a shrinking or barely growing economy, an investment slowdown, and continued job losses, the President made growth and jobs his number one economic priority. There are others who think he should make deficit management the top priority – but the Administration does not share that point of view. Deficits are worrisome, but not as worrisome as an economy that is not growing and is rapidly shedding jobs. It is also important to be aware of how these deficits arose. About half of the change in the fiscal outlook since the President took office is attributable to the weak economy, including the stock market. About a quarter is due to higher expenditures, mainly on homeland security and defense. The last quarter is due to reduced revenue from the tax cuts. And these estimates are based on static scoring, so they surely overstate the role of the tax cuts. What is important is to have a plan under which the deficits shrink over time relative to the size of the economy. This is the case under the President’s policies. The deficit as a share of GDP is projected to diminish by more than half over the next five years. Looking back after four years, I think this holds up pretty well. Economist Austan Goolsbee reviews Michael Moore's Sicko. A prepublication copy of The Bottom Billion by economist Paul Collier has been sitting in my office in-box for the past several months. This compelling book review by Harvard historian Niall Ferguson convinces me I should have found the time to read it. Now I will. The one-line summary: "If Sachs seems too saintly and Easterly too cynical, then Collier is the authentic old Africa hand."